When you’re Polished for Pennies, or “P4P” as we like to say, you’ve got to look at everything with an eye for transformation! Considering spring is a busy time for weddings, showers, outdoor events and more that means you’ll be looking for a singular sensation that will take the hassle and the cost out of dressing up! In that case, we suggest going with something monotone and styling it with what you already have! We found this beautiful Isaac Mizrahi dress from Nordstrom Rack for $44! It’s heavy with luxury polka-dotted lining, and has great zipfactor, with a back zipper that will pop your foot with glee because of great fit! But let’s talk accessories! The beauty of a monotone, is that you can change it’s tone/personality simply through a belt and shoe! We’ve taken one dress and switched it up three ways using metallics, prints, and color we had peeking through our own closet! Our first look is inspired by adding another POP of color! We took a hot orange “bow” accented belt, and fastened it at the waist. Then since the belt had a hint of gold, we paired it with a gold strappy sandal and used that metallic shoe almost as a neutral! Metallics can be great as neutrals because it doesn’t add color, it adds a warmth or cooler tones to an outfit! But, with this small splash of color on color, the belt compliments the dress and the gold brings everything in harmony! So much so you’ll be singing and swaying at your next soiree! With this look we went ALL metallic! Metal on gunmetal! If you compare the photo on the bottom with the photo on the top, the gold and silver, you’ll notice how styling with gold creates a warmer look, and the silver creates a cooler look. Both however are just fabulous and would be perfect for day or night! However, you could go warmer in the day and cooler at night… but switch it up as you may! Playing with color tones on a monotone can add a little more drama. Using a vintage lion’s head embellished belt and bejeweled shoes, this dress personality will put a twinkle in anyone’s eye! Finally, with our last look we had a little more fun! 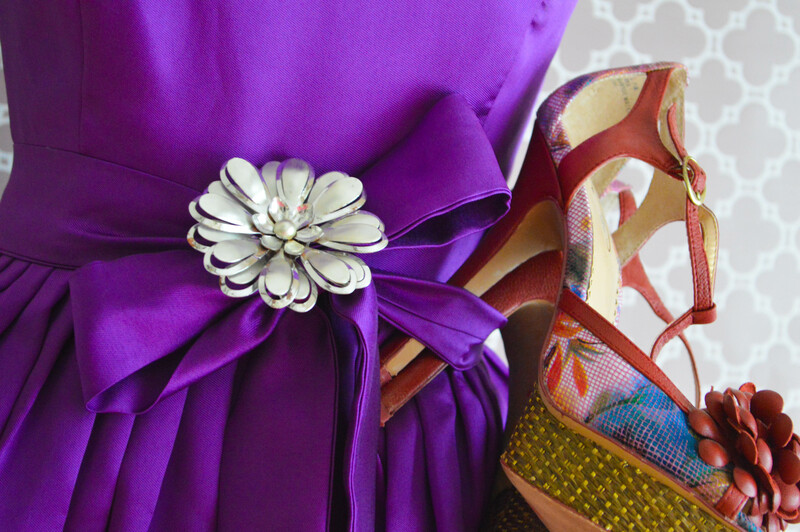 We took a floral pin and attached it to the existing fabric belt that came with the dress! *Tip, just because a dress comes with a belt, don’t feel you always have to use it! Switch it up like we did in the previous looks, or add more flare as we did with this one! We also added a floral inspired printed peep toe and imagined ourselves in a relaxed garden setting. *Tip: Visualizing where you’re going, what the ambiance will be like, and what kind of party it will be will help you style the perfect outfit! So for your next party will you be POPPING your monotone with COLOR, METALLIC NEUTRALS, or PRINTS? Previous PostColor Mixing? Why NOT!